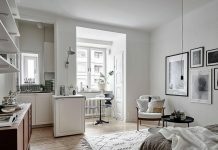 Roohome.com – Grab your chance to decorate your ordinary small apartment by applying a Scandinavian small apartment design along with contemporary interior ideas. 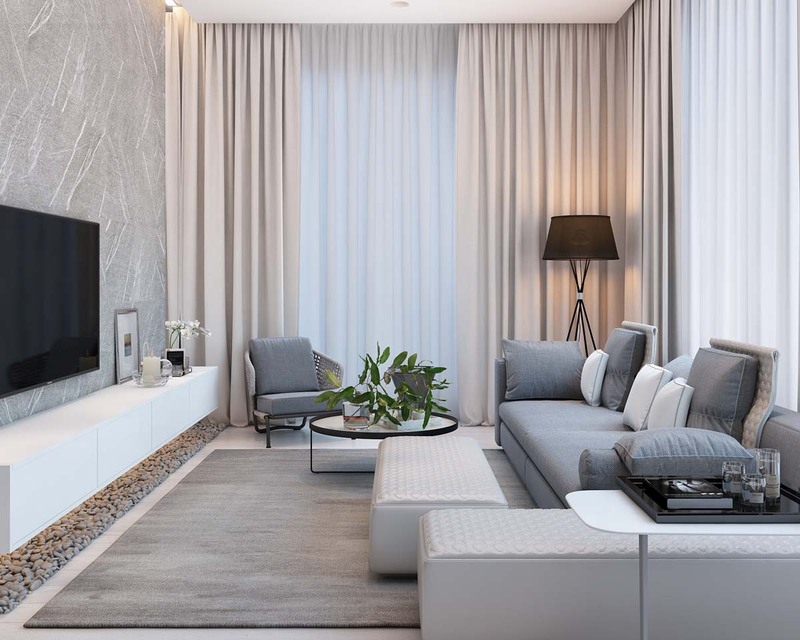 The design is suitable for a modest apartment because the designer knows clearly how to arrange the apartment becomes stylish and stunning. 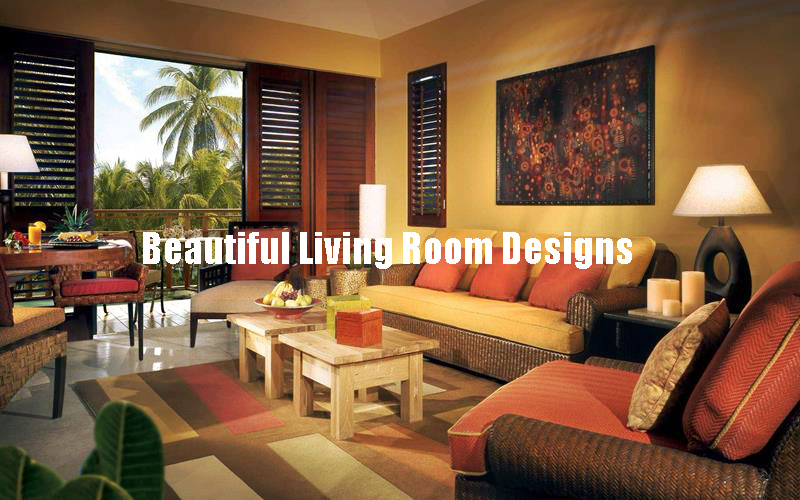 This design will help you a lot and give a new inspiration in designing a small apartment. This is your turn to make your dreaming apartment come true. Let’s take a look! 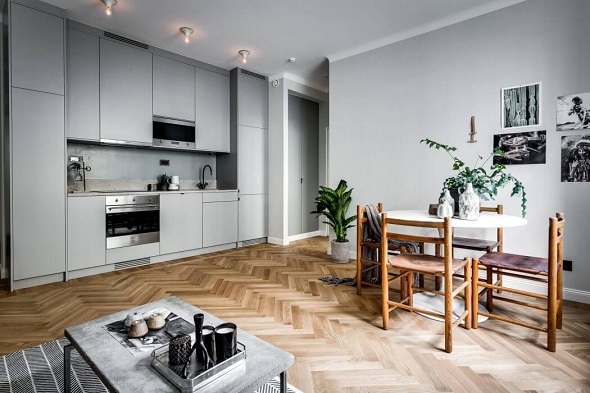 The designer, Alexander White, decides to choose Scandinavian style look to be applied in this small apartment. 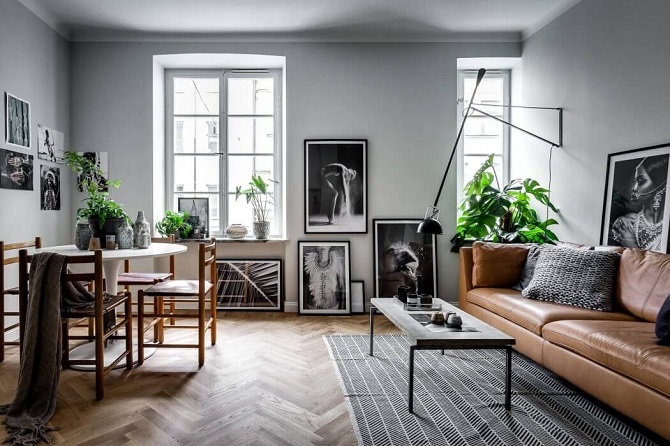 Nowadays, most of the interior designers tend to make a concept of Scandinavian in order to generate an extraordinary look of the apartment. Therefore, the designer tries to balance the concept of Scandinavian with the interior. For the interior, Alexander White uses contemporary features. But first of all, you must take a look the color theme of this modest apartment. The main color is a light gray. The gray itself looks neutral and balanced with other soft tone colors. For example, in this living room, the designer makes the main point of interesting view from the brown leather couch. Although the wall is painted with light gray colors, yet the interior is pretty colorful. 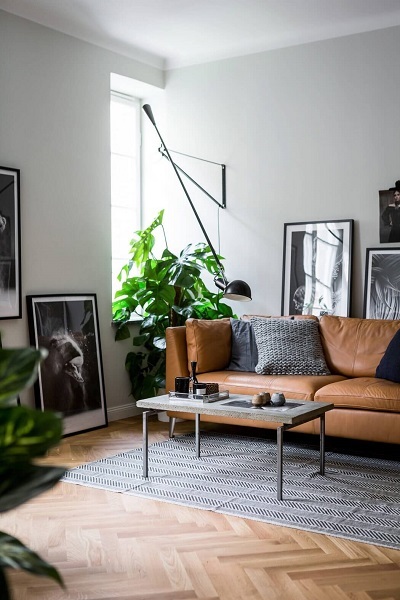 Besides that, the designer also adds some contemporary decorations such as black and white pictures in order to produce an artistic value and greeneries to make the living room more livable. 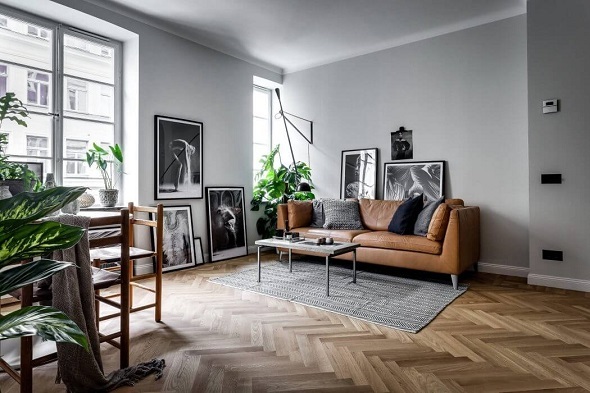 Applying contemporary interior for a small apartment would be great if you can combine it with a Scandinavian interior. For example, in this kitchen, the designer keeps being conformable or consistent in using Scandinavian design ideas. 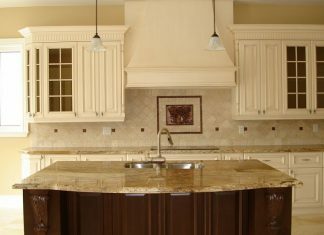 The kitchen set is designed simply with gray tone colors in every inch of the kitchen. 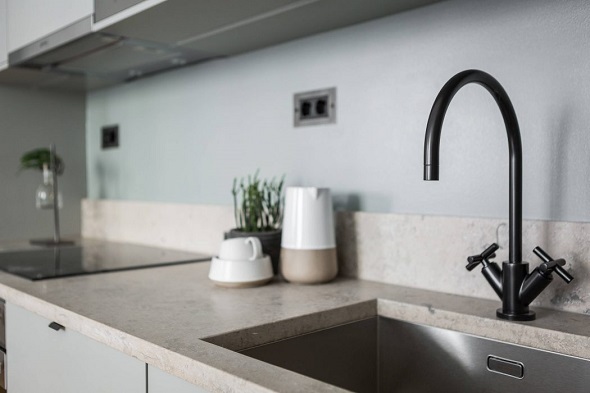 The kitchen feature looks stylish and modern as well. Meanwhile, the dining room is designed as modern as the kitchen as well. 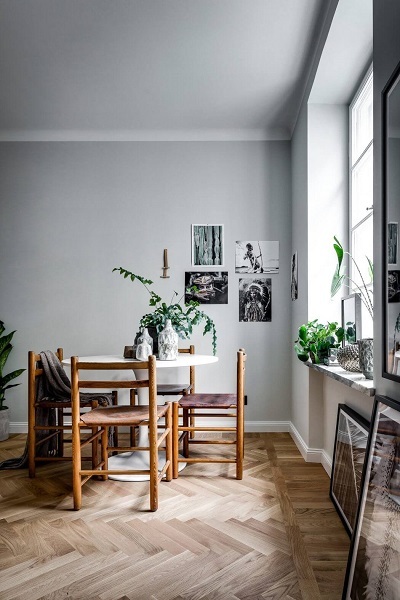 Alexander White places the dining table near the kitchen and living room, yet it will not ruin your Scandinavian small apartment design look. The dining table is stringed up by wooden accents. The wooden itself looks consistent with the wooden flooring. 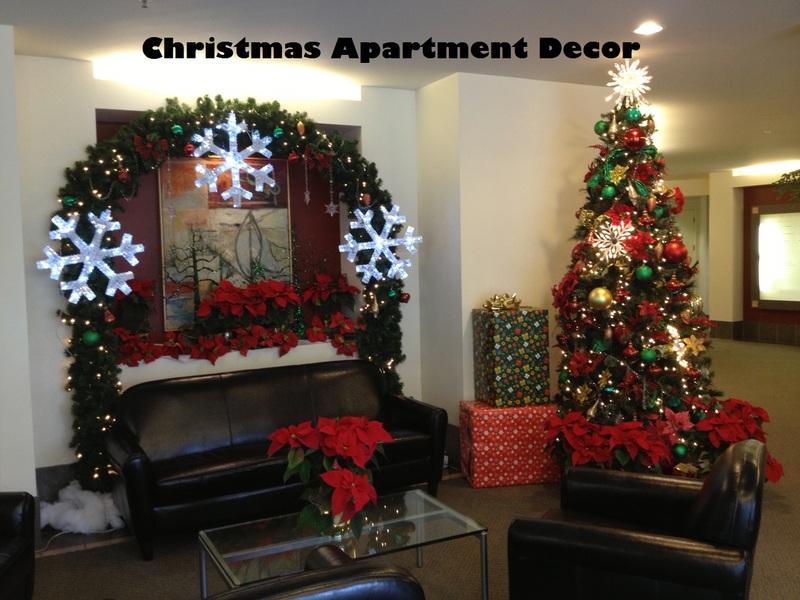 Do not forget to add some decorations in order to beautify the dining room area. You wanna have a cozy place where can loosen your fatigue from daily activity, don’t you? 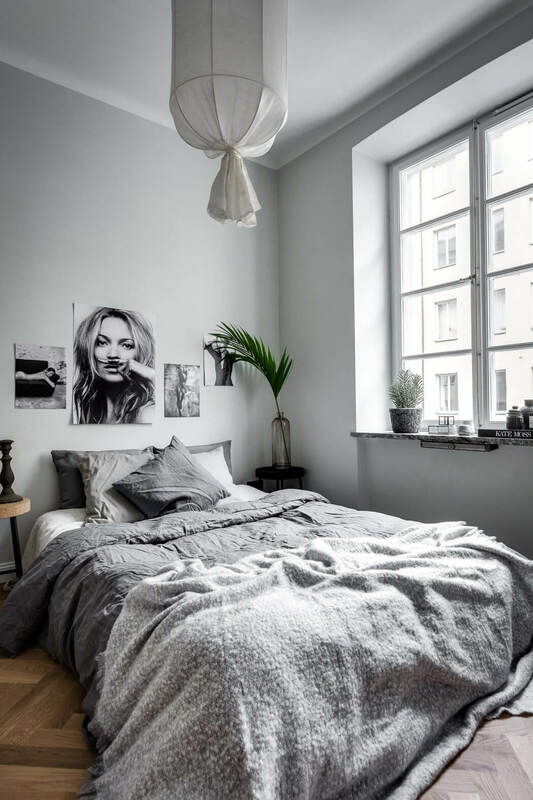 Here is a good idea for you in decorating your bedroom. The designer chooses a contemporary arrangement in order to bring coziness. The bedroom has an artistic view as well just like the previous room. It is a good idea if you try placing some modern furniture as well. If you have a modest bedroom, a good furniture for you is a simple side table in order to minimize the room. You can follow Alexander White’s idea. Meanwhile, the bathroom is quite cleaner and gorgeous. 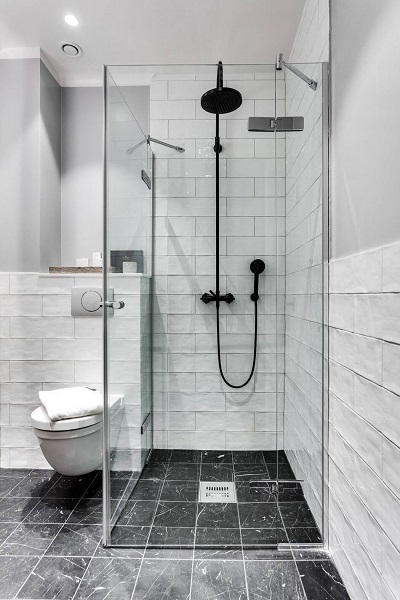 The designer uses a modern glass shower door and a black handheld shower also the bathroom accessories. 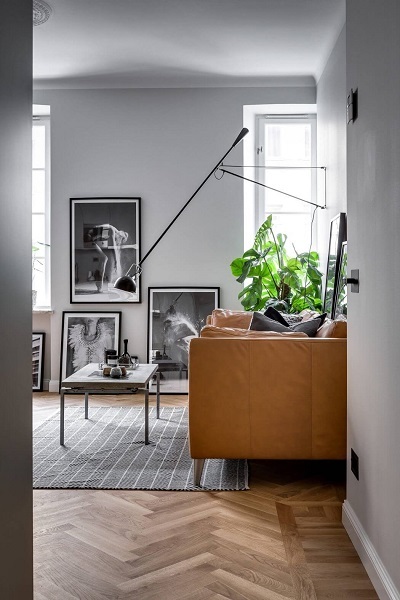 Choosing Scandinavian small apartment design will not disappoint you. Why? Because this design is designed by a brilliant interior designer, Alexander White. There are small apartment design ideas 2016. If you want to see the designs, just visit and check here. Have a nice day!